Garden View, Lake View, Panoramic, View, Water View. 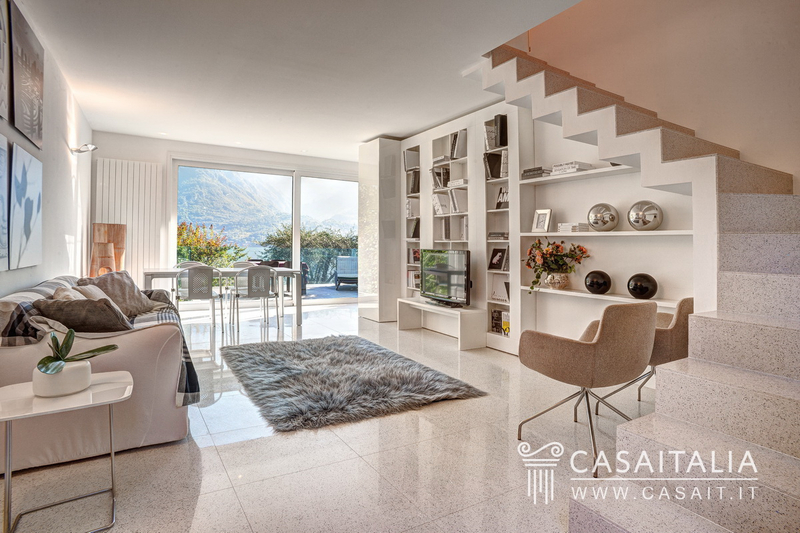 In an excellent location on the bank of Lake Como going from Bellagio down towards Lecco, the property is one of the most important residences in the area, comprising the main villa, built in the 1950s and a newly-built annexed villa, surrounded by lush grounds with a dock, beach and private access to the lake. 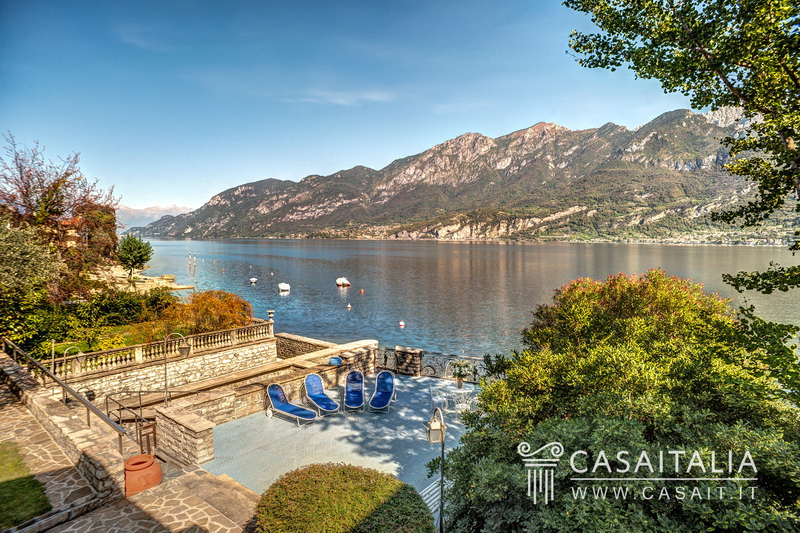 The property is within easy reach of Bellaggio (7 km) and Lecco (14 km) by the coastal road that runs along Lake Como. Milan (58 km) and Como (31 km) are less than an hour away by car, with their easily reached motorway connections with Switzerland and the rest of Northern Italy. 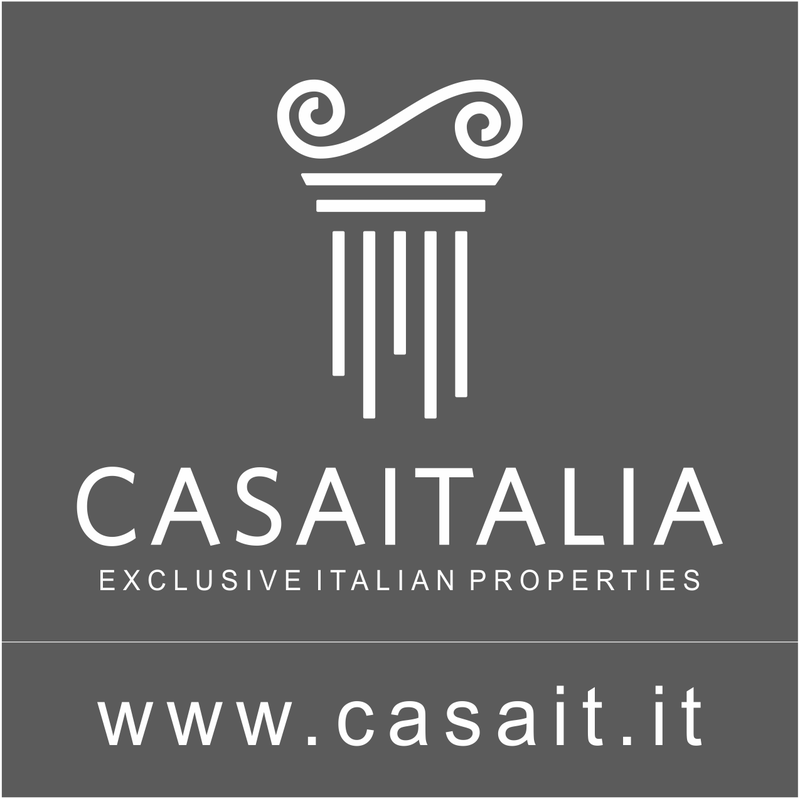 The nearest international airport is Bergamo Orio al Serio (55 km) while Linate is 65 km away (1 hour by car) and Malpensa (83 km) is about an hour and twenty minutes. Description of buildings Main Villa Built in the 1950s, it has a total surface area of 450 sq.m over three floors. The ground floor is divided into living and sleeping areas, with a unique view of the lake in comfortable and sophisticated surroundings. In the living areas, the large and bright living room comprises a convivial area with fireplace and dining room next to a well-equipped kitchen, also with original stone fireplace, from which there is access to the exernal barbecue area. To the front of the living room there is a pretty porch and a terrace with a view of the lake, ideal for al fresco lunches and dinners. 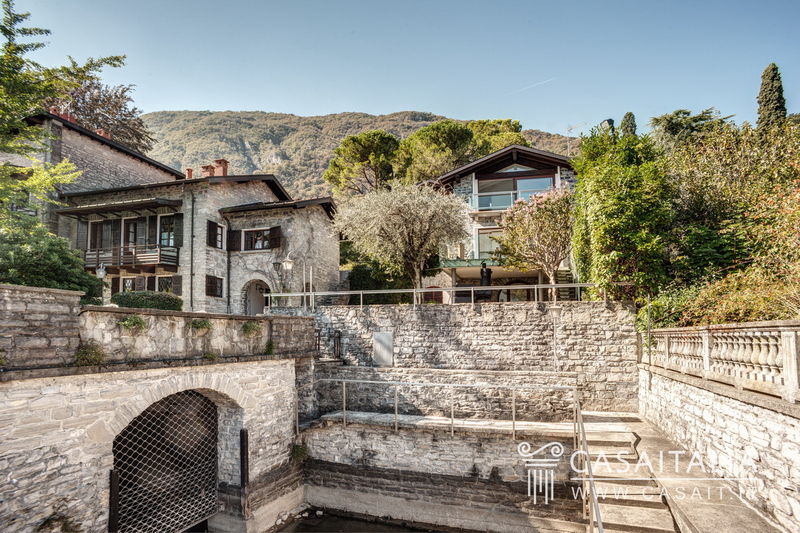 The sleeping area on the ground floor is separated from the living area by a French door, and comprises two beautiful bedrooms with en-suite bathrooms and splendid balconies looking out on the lake and the Alps, another bathroom and the staircase leading to the floor above. On the first floor there are the other bedrooms, the large and luxurious master bedroom with a large terrace overlooking the grounds and the lake with a beautiful bathroom in Bisazza mosaic with Jacuzzi, other bedrooms with two bathrooms and a large loft The basement level is divided into 4 areas, a cellar with solid-wood furniture and fireplace, a large storage area, a wine cellar and a bathroom. Second villa The villa, recently built, has been integrated architecturally with the main villa, and comprises an entrance which opens into an extremely bright open plan area with living room and Varenna by Poliform kitchen, which provides contemporary comfort in contrast to the period finishings of the main villa. 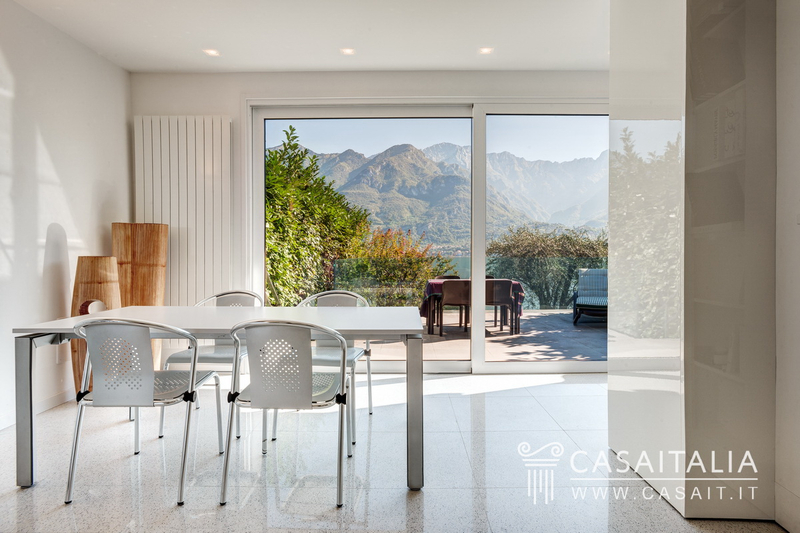 A glass partition with state of the art sliding doors gives a feeling of ‘infinity’ with the terrace overlooking the lake from which you can take in the view of the mountains and the sky reflected in the water. 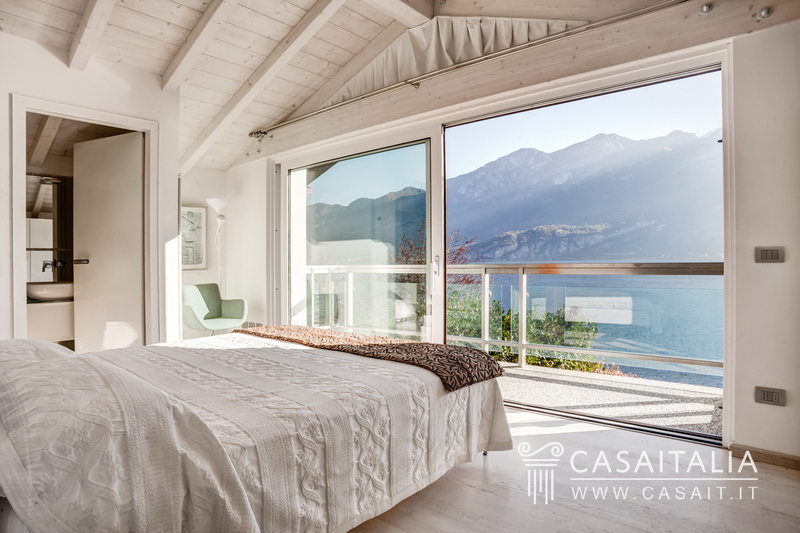 The sleeping area on the top floor comprises the master bedroom with en-suite bathroom and a glass partition with a breathtaking view of the lake and two further double bedrooms with a bathroom. 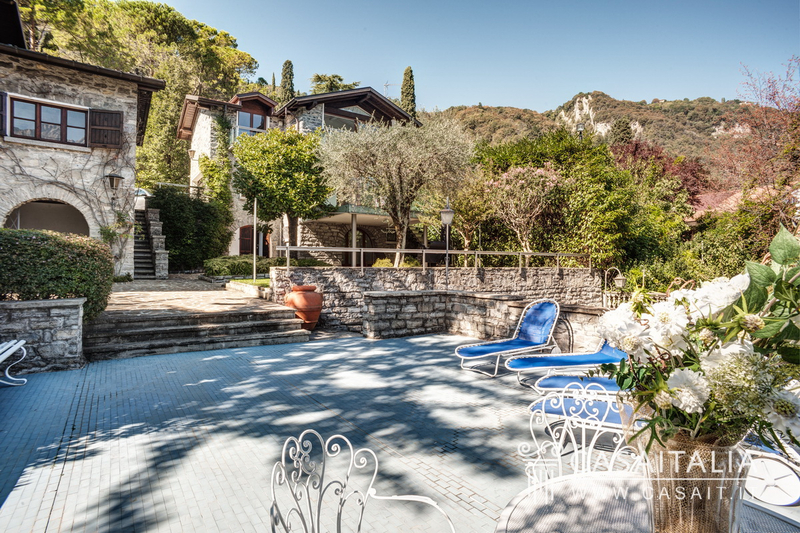 In the basement there is a relaxation area with sofas and a fully-equipped gym, with bathroom and hydrotherapy pool, with direct access to the garden. Also on this floor there is also a laundry room, another barbecue area and a large utility room with access to the technical area. 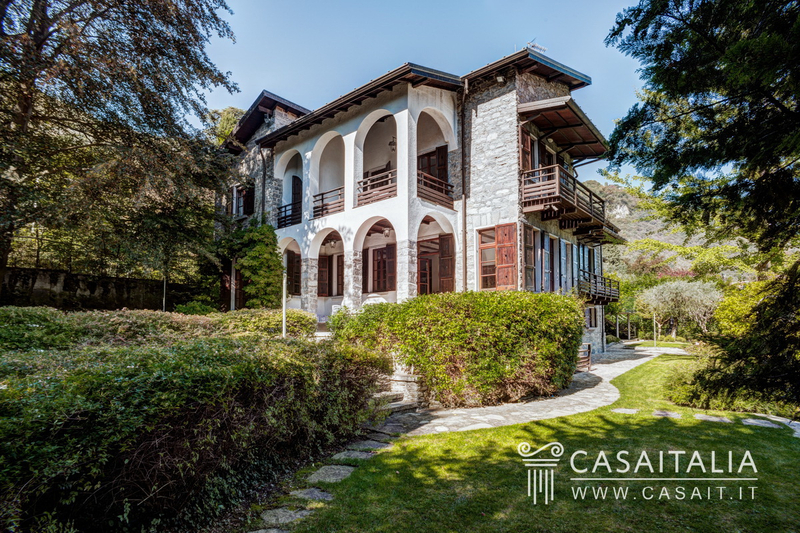 The property also comprises a large garage of 25 sq.m on the ground floor of the second villa, a courtyard which connects the two villas and could be used for parking and direct access to the lake, with a little beach, dock and shelter for private and exclusive trips. 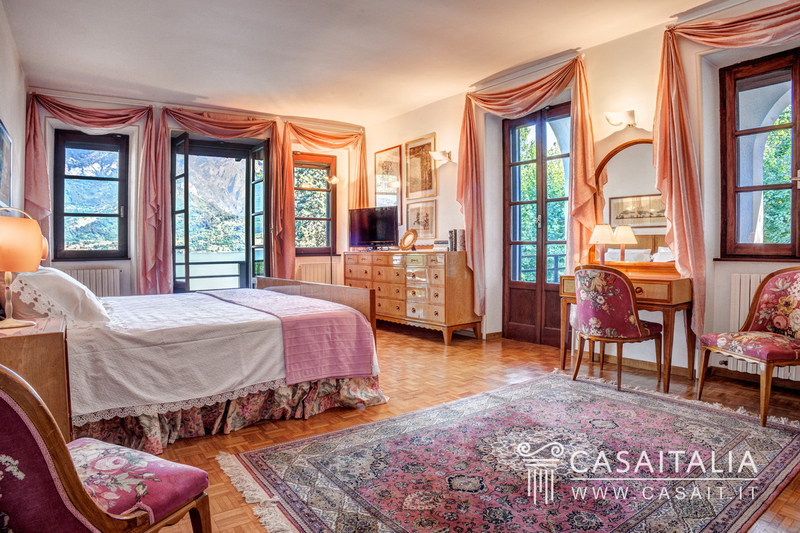 State and finishing The main villa retains the original features from the 1950s, which have recently been carefully looked at and restored. 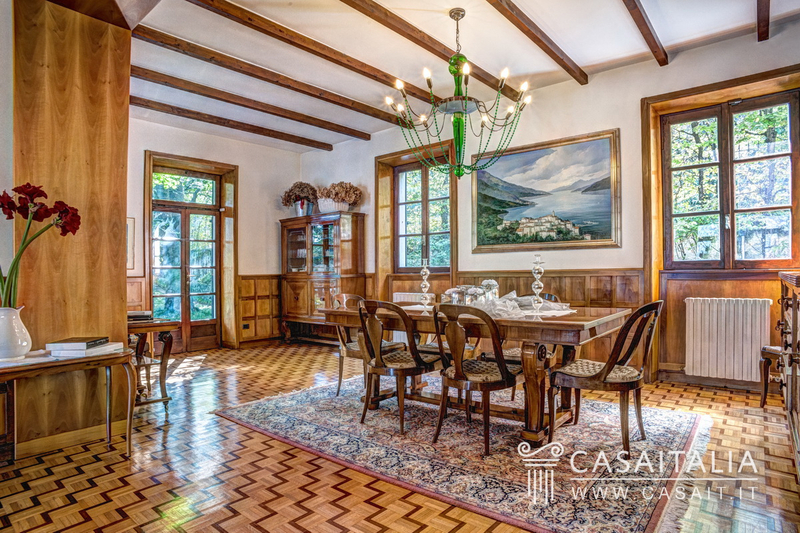 The beautiful, period parquet floors, the original window fixtures and the carefully chosen retro-chic lighting elements give the property a unique charm. All the bathrooms and appliances have been restored. 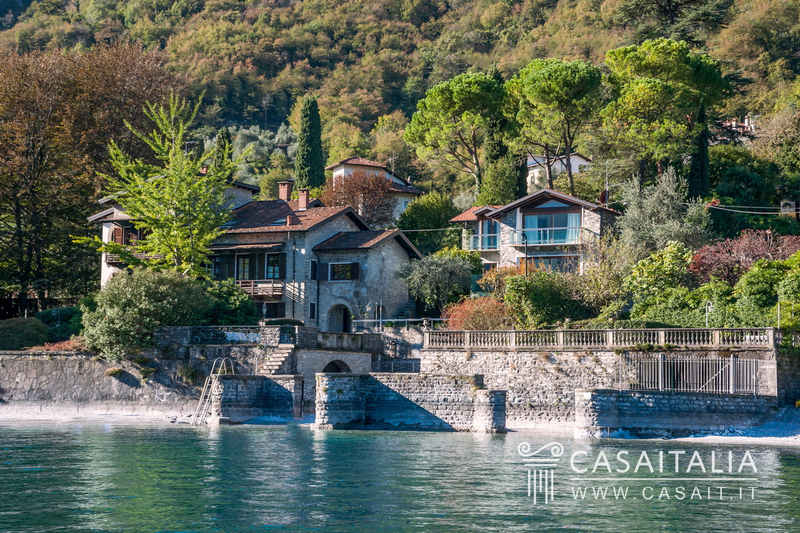 The second villa has been recently built with high-quality materials and is a little gem on the banks of the lake. External areas The two villas are surrounded by 1.480 sq.m of private, landscaped grounds, with flowerbeds, tall, indigenous trees and Japanese maple trees, through which there is direct access to the lake. 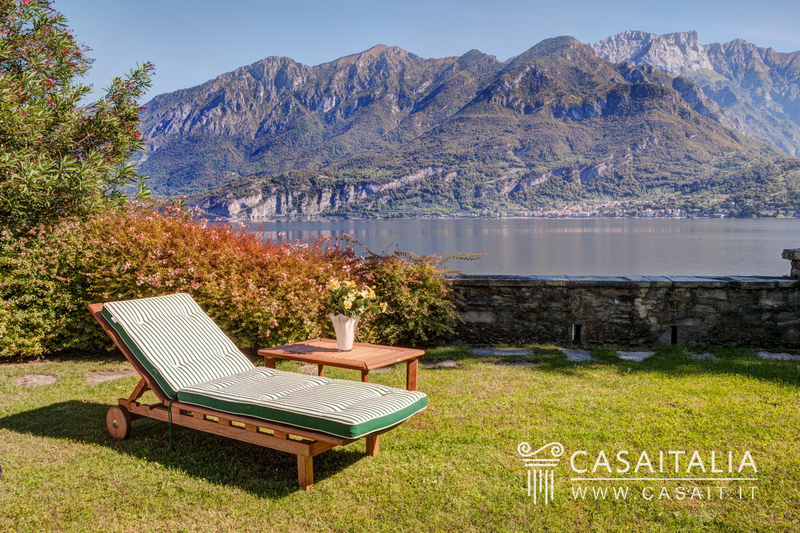 Use and potential uses The property is one of the only ones with this lakeside view and is ideal as a main residence or a second home, with the possibility to rent it out to Italian or foreign guests looking for short-term holiday rentals.